Most of the kitchen tools and devices necessary for bread making are simple items that are found in most home kitchens: measuring cups and spoons, a large bowl (preferably glass), a large spoon (preferably wood), a work surface, a dish towel, a sharp knife, and a baking sheet. Other pieces of equipment are available that are very helpful in bread preparation, such as kitchen scales and electronic appliances, but they are not essential in achieving excellent results. Measuring Cups: for measuring larger quantities of dry and liquid ingredients. 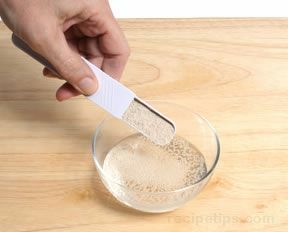 Measuring Spoons: for measuring smaller quantities of dry and liquid ingredients. Kitchen Scale: not essential, but very helpful for weighing precise quantities of flour and other ingredients. 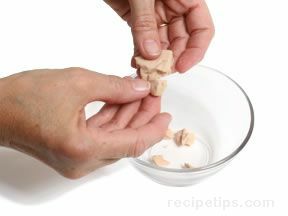 Bowls: several sizes are essential for mixing ingredients. Glass bowls are preferred, but pottery, porcelain, and plastic bowls are often used. Metal bowls should not be used because the metal may react with the yeast. Utensils: wooden spoons are best for combining ingredients for batter and dough for quick breads and for preliminary mixing of ingredients for yeast bread dough. 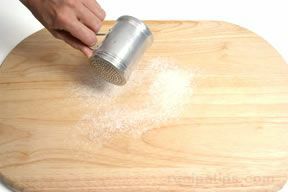 A plastic dough scraper is a useful tool for cleaning dough from work surfaces and a dough cutter is useful for dividing dough. 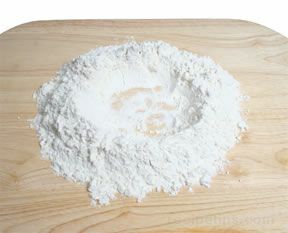 Work Surfaces: a clean flat surface is necessary for kneading and shaping dough. A marble slab is an excellent work surface as is tempered glass. 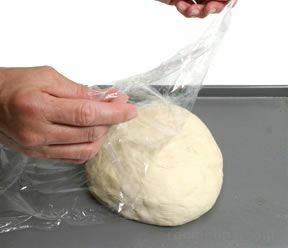 Plastic and wood cutting boards are often used, but it is best to have one on hand that is used specifically for bread making. A clean, smooth kitchen countertop may also be used. 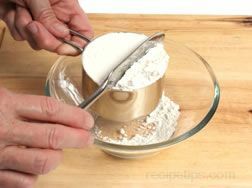 Flour Duster: a handy tool for adding flour to the work surface and to the dough. 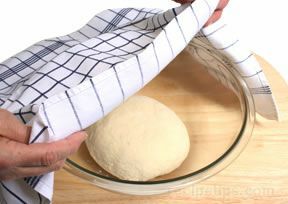 Kitchen Towels: are necessary for covering dough during the rising time. Proofing Baskets: optional equipment used for the final rising period. "Bannetons" are used for proofing long loaves such as baguettes and "couronnes," are used for proofing round loaves. Many varieties are usually lined with linen or canvas. Plain, unlined baskets can be used for proofing if they are dusted with flour. The weave of the basket adds an interesting pattern to the bread. Electric Appliances: kitchen appliances, such as food processors and heavy-duty mixers are useful for mixing ingredients for batter and dough. 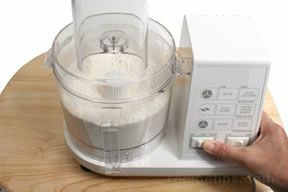 A heavy-duty electric mixer with a dough hook will also knead the dough. 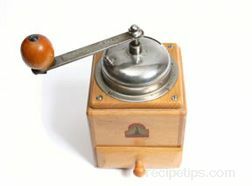 Bread machines do all of the bread preparation and even bake the bread and are useful tools for home cooks who do not have the time necessary for preparing bread by hand. 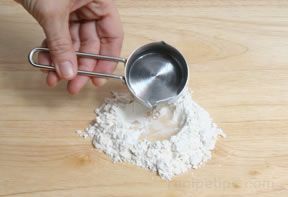 Flour Sifters or Sieves: for sifting various types of flours together and/or the other dry ingredients. Instant Read Thermometer: for checking the temperature of the warm water used for activating the yeast. 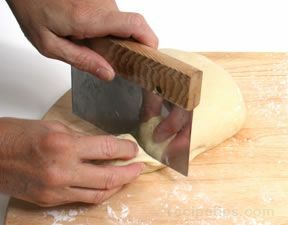 Knives: for slitting dough and creating designs. Scissors: for trimming dough or creating designs in the dough. Rolling Pins: used for flattening dough for specific shapes (flat breads, pizza dough, etc.). 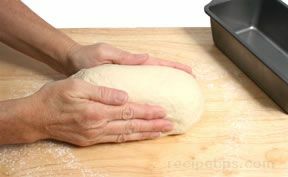 A rolling pin is also useful for flattening dough for breads in which ingredients are sprinkled on the flattened dough and then rolled up into a shape similar to a jellyroll. Pastry Brushes: useful for applying a glaze or wash (oil, egg, milk) on the bread dough before baking. 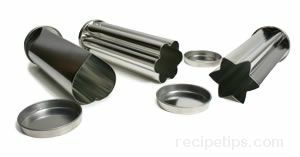 Bread Pans and Molds: loaf pans, round pans, square pans, cylindrical pans, baguette trays, brioche molds, panettone forms, muffin tins, and many others are used to create breads of specific shapes. Other Baking Containers: almost any other type of oven-safe and food-safe container can be used to bake bread, such as a stoneware baking dish or terra-cotta pots or even coffee cans as is the case when making Boston brown bread. When using a terra-cotta flowerpot, it must be thoroughly dry. It is best to place it in a warm, sunny location for several hours. After drying, the pot should be well greased with cooking oil, placed in a 375ºF oven for about an hour, and then cooled. This process can be repeated several times until oil has thoroughly soaked the terra-cotta. 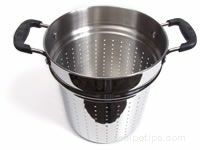 The seasoned flowerpot should not be washed after use because washing will have an adverse effect on the seasoned surfaces - simply wipe the pot clean. 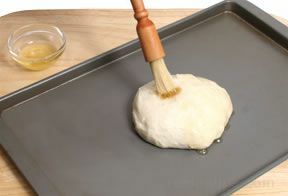 Flat Baking Surfaces: flat pans, baking sheets, flat baking stones, and tiles are used as surfaces to bake hearth breads. Many yeast breads can be cooked on a baking sheet. Spray Bottle: for adding moisture to the oven. Wire Racks: used for cooling freshly baked bread. Bread Boards: a useful surface for slicing bread. It is best to have a board that is used specifically for bread slicing to avoid contamination with meats, vegetables, etc. All boards should be thoroughly washed after using. Bread Knives: long serrated knives are best for slicing bread.